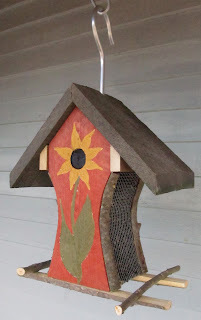 Our Buoy Bird House isn't the most functional house we make, but it is the most decorative. 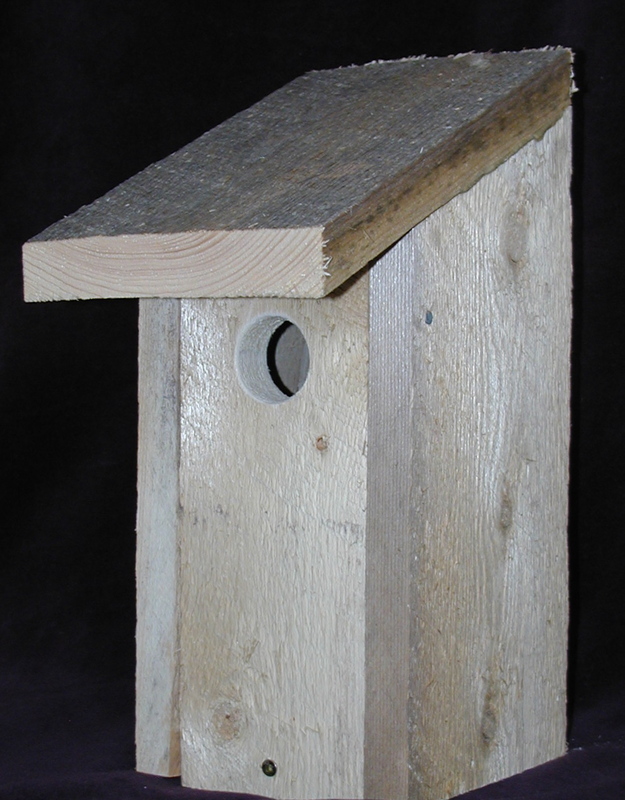 Made to size for most small cavity dwellers, we've had reports of Tree Swallow, Chickadee and House Wren using this house. It does open for cleaning. Comes in various colours and/or without flower carving. Another decorative house, this one is also quite functional. You are limited to top of post mounting though. It's the right size for small cavity dwellers, 1.5 inch hole eliminates Starlings. This plain and simple house is a favourite for Chickadee, Tree Swallow, Eastern Bluebird, Downey Woodpecker, and more. 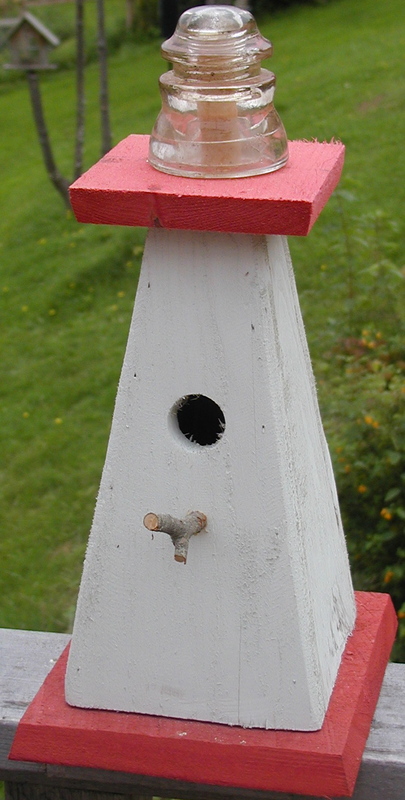 The 1.5 inch hole excludes Starlings. Vented, drained and easy to clean...at this price you should add a few to your yard. The sale starts now and runs until the middle of May. 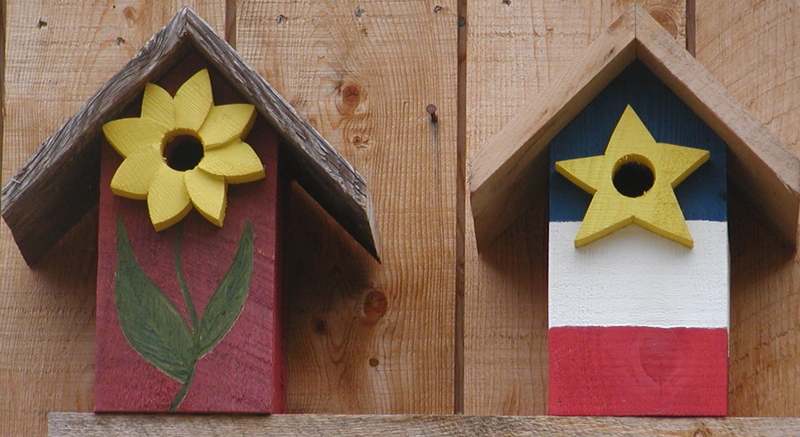 Shown are a new house and one that has been out and used, by Chickadee or Tree Swallow in summer and Downey Woodpecker in winter, for over 10 years. And no, the old one isn't for sale. This is our economy model, at this price we often sell a dozen at a time. Great for anyone thinking of starting or adding to a "Bluebird Trail" or just wanting to attract more mosquito eating Tree Swallows. Chickadees love it too. The front opens for cleaning and hanging, it extends past the floor making opening easier. It has all the features of our more expensive houses at a great price. Made from rough lumber and quarter inch mesh wire. Holds black-oil sunflower.